Looking for a way to embed WordPress Google Maps content on your site? 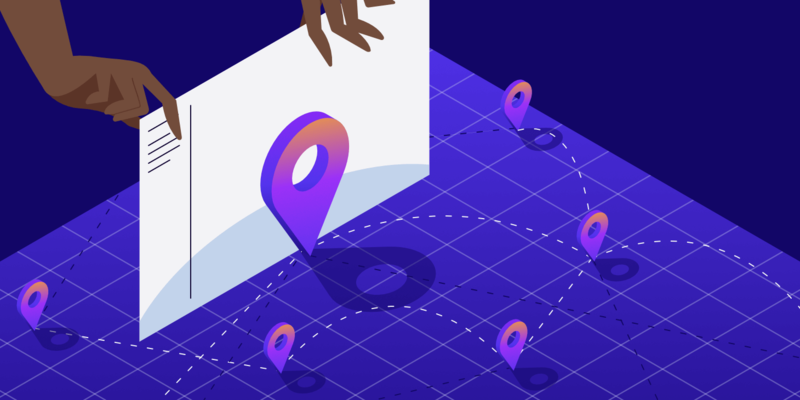 Like a lot of things in WordPress, there are several different ways that you can embed Google Maps on your site depending on what type of map content you want to include. As of June 11, 2018, an API key is now required for Google Maps. If you’ve already implemented Google Maps on your site and it’s no longer working, this might be the reason. Or rather, you’re missing the API key. The good news is, for 99% of you, it should still be free. 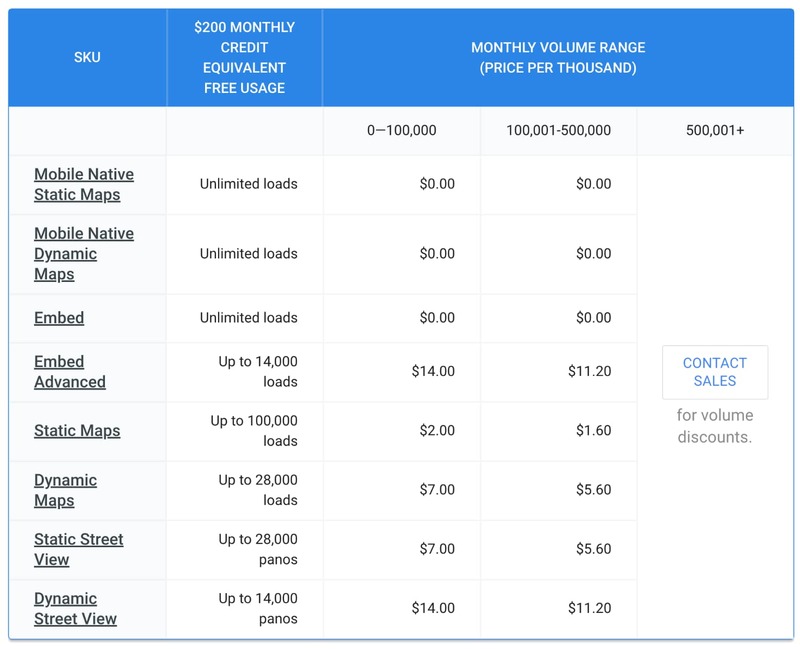 Below is the Google Maps API pricing. Google also gives you a recurring $200 credit on your billing account each month to offset your usage costs. So as you can see unless your generating thousands of requests, using Google Maps on your site shouldn’t cost you anything. Sign up for a Google Cloud Platform Console account and configure it. Add your billing info, even though you might not ever be billed. 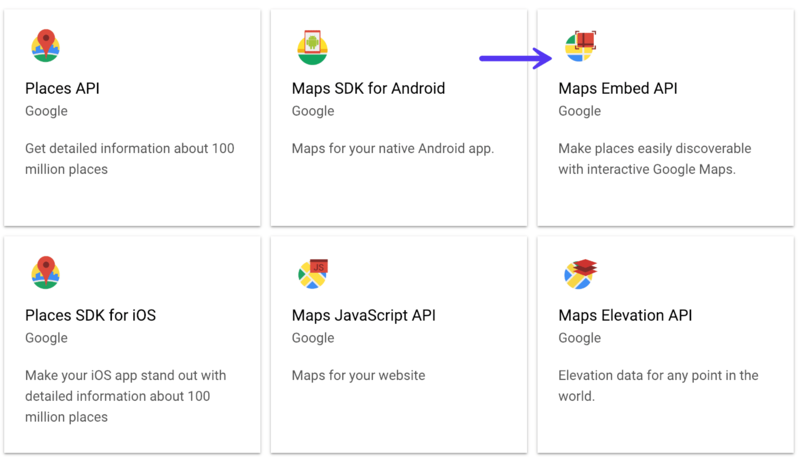 Add the API key to your Google Maps embed code or plugin settings. Below are steps on how to get your Google Maps API key. Go to the Google Cloud Platform Console. If you don’t have an account yet, create one, it’s free. Set up your billing account. Even though they will require you to put a credit card on file, you should never be charged, unless you do go over the high usage limits. You will be asked to pick one or more products. This depends on the type of map you’re using. 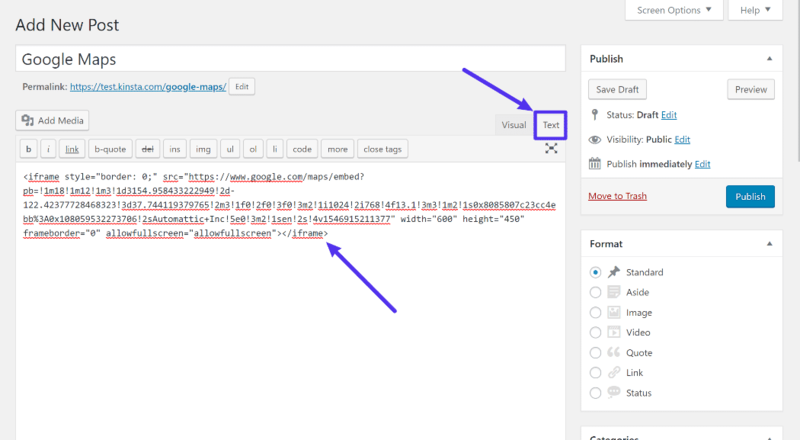 For example, if you are embedding a map on your WordPress site without a plugin (as shown in the steps further below), then you would pick the Google Maps Embed API. If you are using a plugin like Google Maps Widget (as shown in the steps further below), then you would choose the Google Maps Static API. If you’re using a third-party plugin or theme, they should have documentation on which type of Google Maps deployment they are using. Don’t worry, you can always add multiple types and change these later on. Click on “APIs” and then under “Credentials”, you will see your API key. 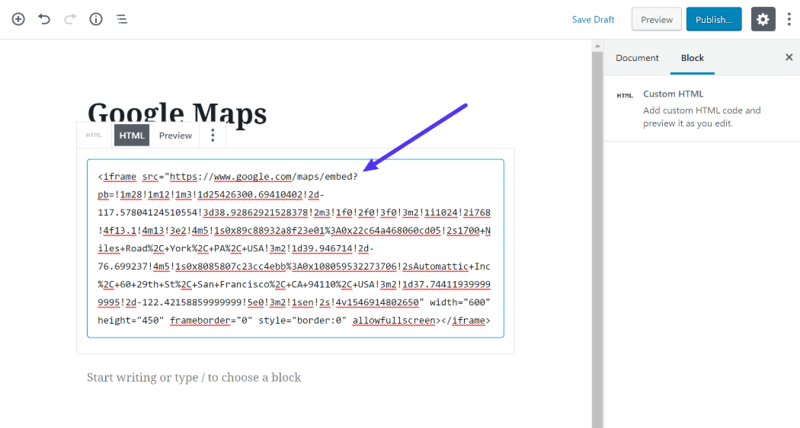 If you’re simply embedding your Google Maps API key it will show in plain text in your source code. Therefore you should restrict this, otherwise, people could use your API key on their WordPress site or projects and rack up your usage. To do this, simply click on your API key’s name and it will allow you to add a restriction. 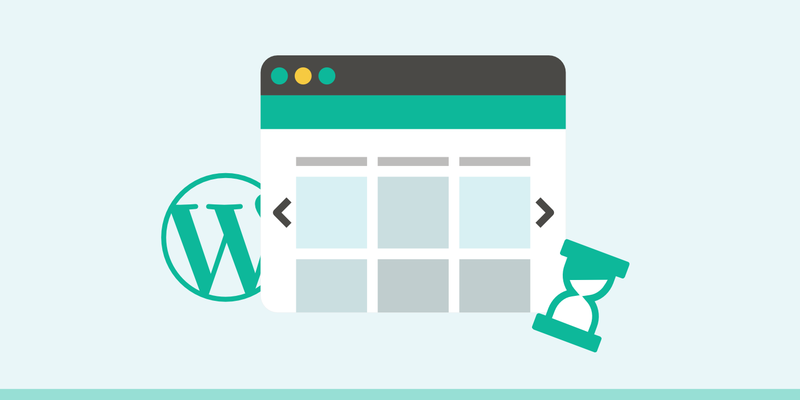 For your WordPress site, simply adding an HTTP referrer should be good enough. Such as https://yourdomain.com/*. This will allow it to only make calls on your website. 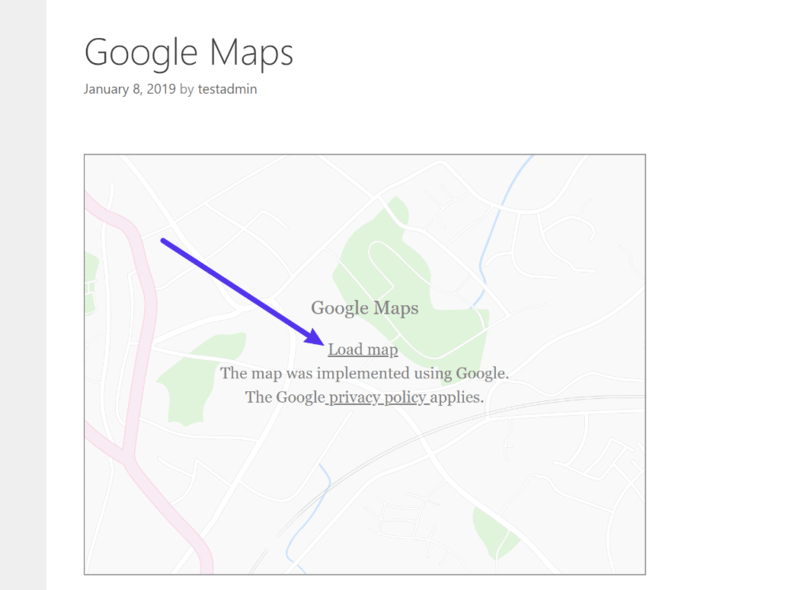 If you just want to embed a simple map and don’t need more detailed functionality like custom location markers or other annotations, you can embed Google Maps without a plugin using the normal Google Maps website that you use on a daily basis. To get started, use the Google Maps website to create the map that you want to embed. For example, if you want to embed a place marker, open that place in Google Maps. Or, if you want to embed directions, open the directions in Google Maps. That will open up a Share popup. In that popup, click on the Embed a map tab. Then, you can choose your desired size using the drop-down. For most WordPress sites, the default size works well, but you can make the map larger or smaller if needed. Now, all that you need to do is add that embed code to your WordPress site in the post or page where you want to include your map. If you’re using the new WordPress Gutenberg block editor that was released with WordPress 5.0, you can do that by adding a Custom HTML block and pasting the embed code into the block. Don’t forget to add your API key. You can preview how your map will look by clicking the Preview button above the block. Once you add the code, you can go back to the Visual tab to see a live preview of your map. And that’s it! You just learned how to add Google Maps in WordPress without a plugin. 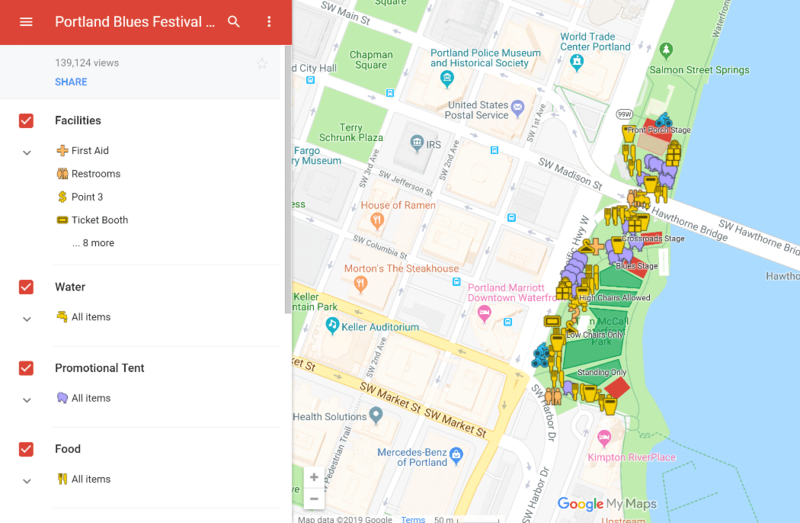 If you want to get more creative when it comes to things like multiple location markers, custom annotations, etc., you can still do that without the need for a plugin with Google’s My Maps service. 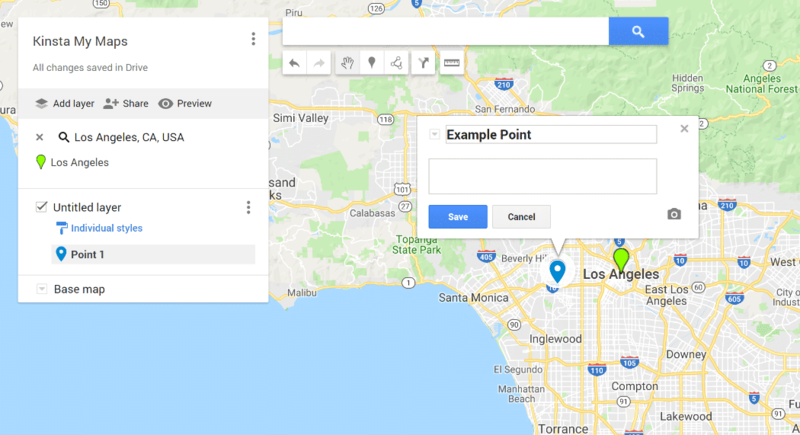 Here’s how to use it to add custom Google Maps to WordPress. While we won’t cover it in too much detail, this interface lets you build some pretty creative maps. For a deeper look, this help article from Google covers a lot of the important functionality. Once you’re finished building your map, you need to generate the embed code. That will open a popup with the code, which you should copy. Don’t forget to add your API key. Now, you can add that embed code to your WordPress site just like you would the embed code that you get from the regular Google Maps website. If you’re not sure how to do that, click here to jump to that section of the tutorial from above. Beyond the manual methods above, there are also tons of WordPress Google Maps plugins that can help you embed maps on your site. They let you create more complicated maps with a simple interface. 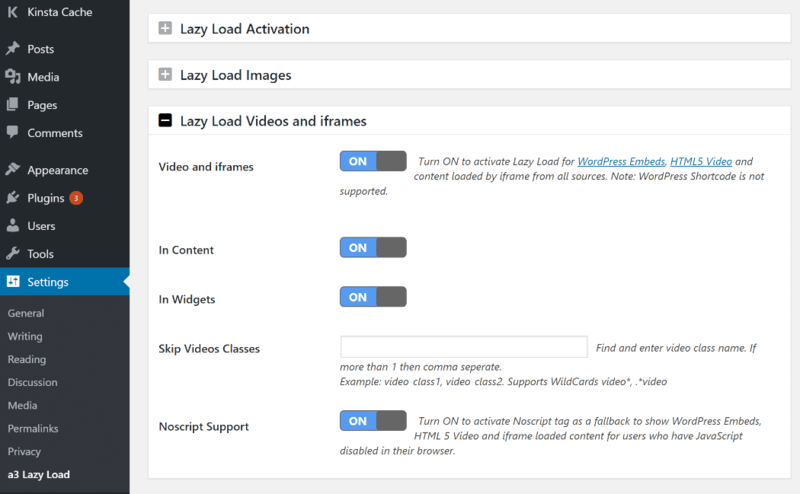 You can do everything without having to leave your WordPress dashboard. Some of them link to WordPress. For example, you might be able to link map markers to WordPress posts. Some of them can help you optimize Google Maps for performance (more on this later). For all of these plugins, you’ll need to generate your own Google Maps API Key before you can start embedding maps. This tutorial shows you how to do that. Google Maps Widget is a simple Google Maps plugin that lets you embed a map using the Google Maps Static API, which offers a more performance-friendly approach by embedding a static image rather than an interactive map (we’ll explain more about this in the next section). You can also use an interactive map right away if desired, and the Pro version lets you embed maps anywhere on your site with a shortcode. Google Maps Easy helps you create custom maps with your own markers and annotations. Once you build your map, you can embed it using either a shortcode or PHP function. Intergeo is another popular option that lets you create your own maps with custom markers and have control over map functionality. Then, you can embed them anywhere on your site using a shortcode. 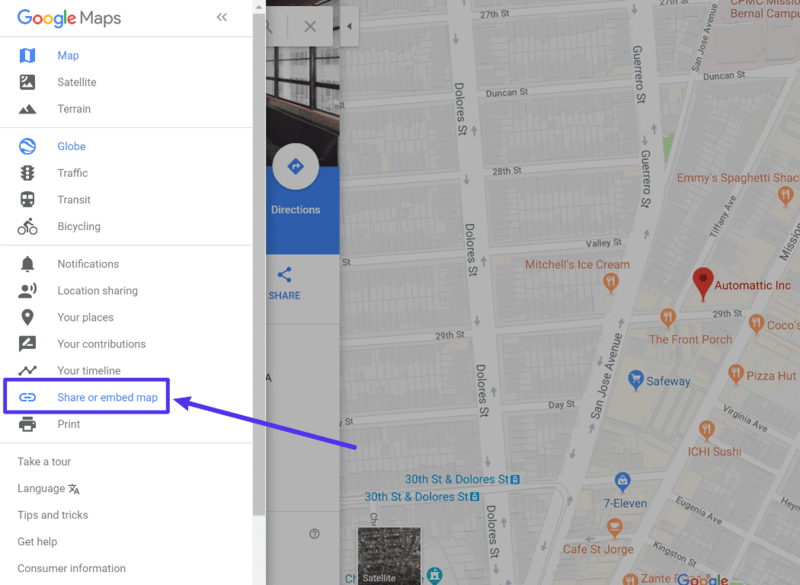 Gutenberg Block For Google Maps Embed is a simple plugin that adds a dedicated Google Maps block to the new WordPress Gutenberg block editor. It won’t let you create your own custom maps – but it is a convenient option if you use the new block editor and just want an easy way to include some simple maps. 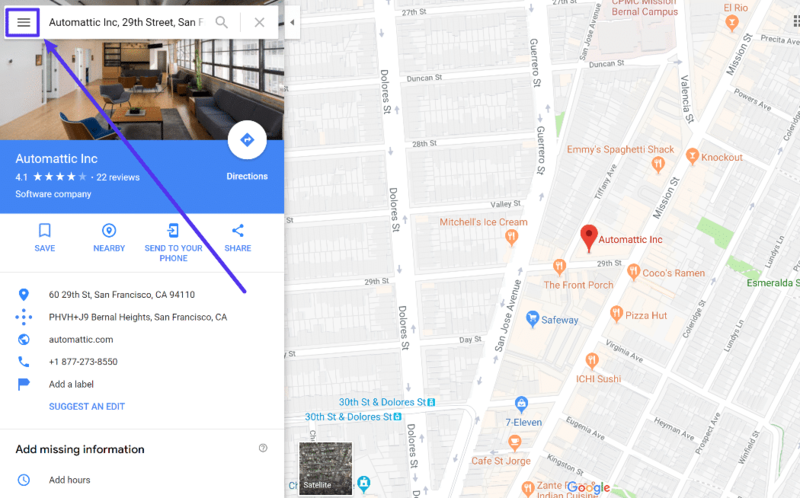 While Google Maps lets you embed a ton of cool functionality to your site with its interactive maps, there is a performance trade-off because it needs to load a large number of scripts to power all of that interactive functionality. Long story short, embedding interactive Google Maps can slow down your site. There are a few ways that you can combat this. 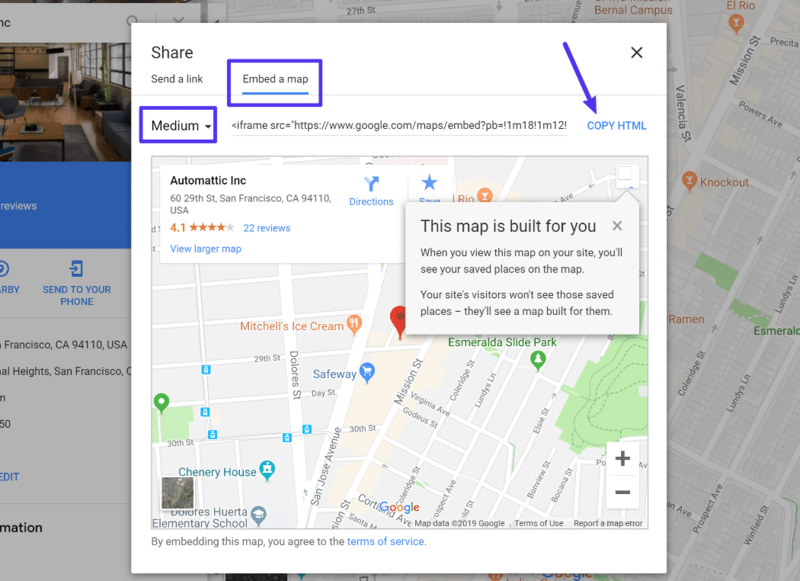 Link that screenshot to the map on the Google Maps website, or open a lightbox popup with the interactive map when a user clicks. That way, your site is just loading a regular image – not all of the scripts associated with Google Maps. 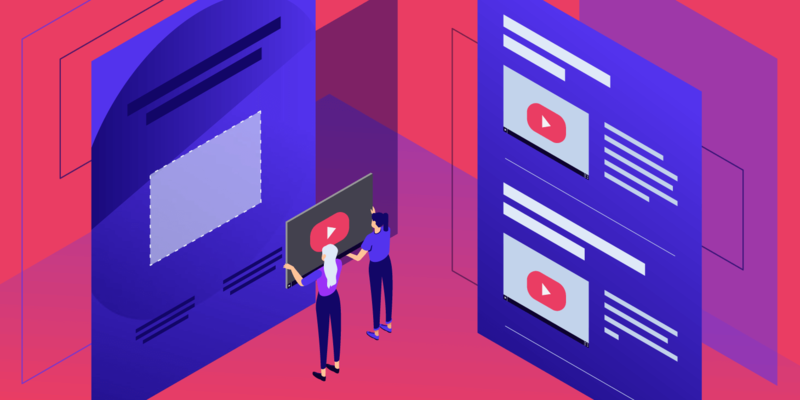 However, we realize that sometimes this static approach just won’t cut it, and a lot of people want to embed the interactive Google Maps experience right away. If that’s the case, another good way to speed up Google Maps is to use lazy loading. With lazy loading, your site will wait to load any below-the-fold Google Maps embeds until visitors start scrolling down the page. That keeps your initial page load times fast, while still letting you embed interactive Google Maps content. We’ve already written about how to lazy load images and videos and it’s the same idea for Google Maps. 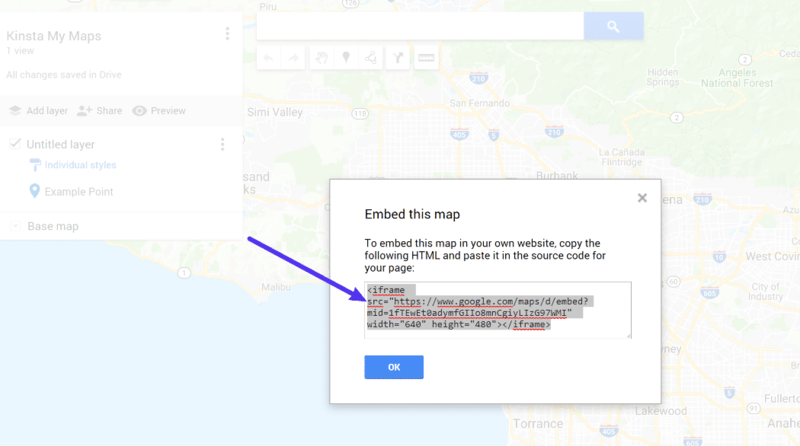 If you just want to embed a simple map on your site, you can add Google Maps to WordPress without a plugin using the built-in embed code feature. Or, you can use the Google My Maps tool to create your own custom map and embed that. Beyond those manual methods, there are also plenty of Google Maps WordPress plugins that can give you lots of control without making you leave your WordPress dashboard. No matter which method you choose, pay attention to the performance impact of using Google Maps. Try to only use Google Maps when absolutely necessary and consider tactics like placeholder images or lazy loading to decrease the negative effect on performance. 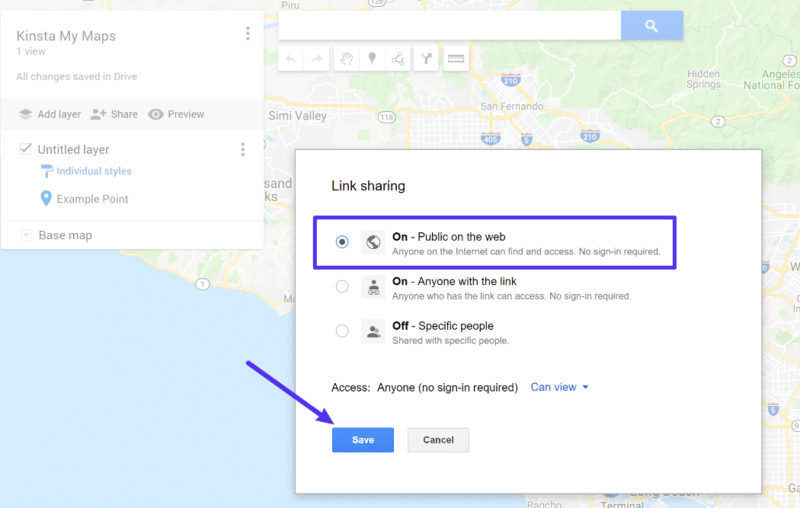 Do you have any other questions about using Google Maps on WordPress? Let us know in the comments! 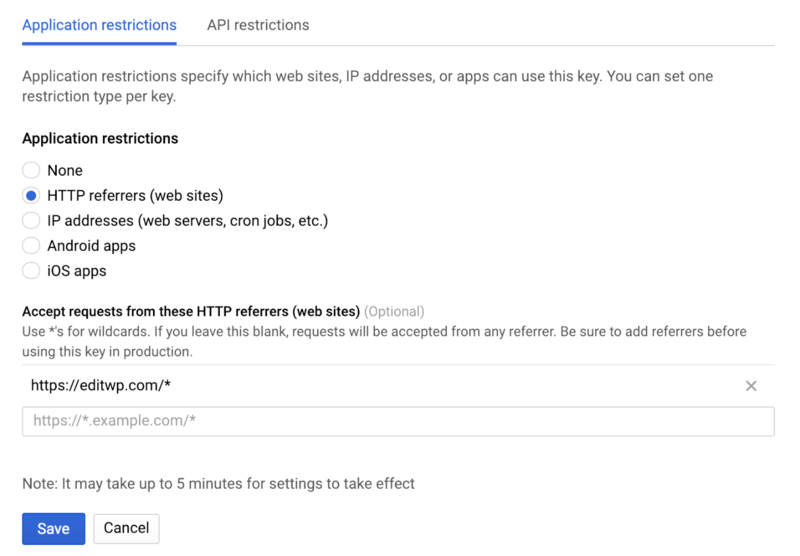 Great article – but doesn’t Google now require API keys to be set up for any website use, with billing information added, in case the website ever goes over it’s free limits? It’s such a pain, since 99.9% sites will never go over, but site owners have no idea why their maps are now broken. Hey Rob, you are correct. Google Maps does require an API now. We’ve added a new section to the post. Thanks! Another option is to not actually embed the map in your page, but take a screenshot of the map and add it in as an image instead. Then link the image so that if it gets clicked it will open up to the proper place/listing in Google Maps. 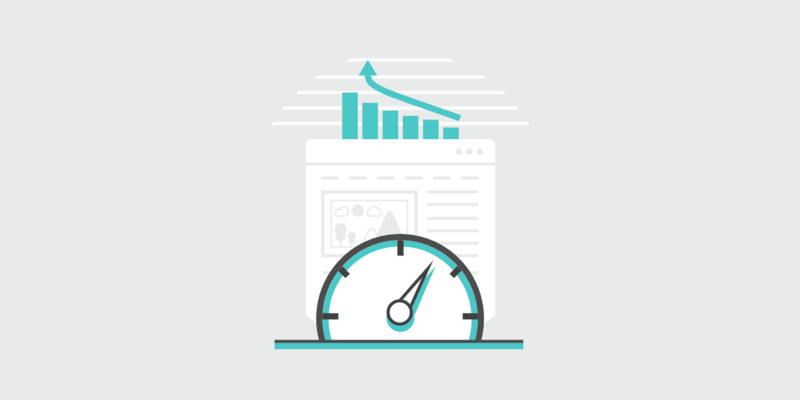 Some people really care about page load speed and this way you can avoid the extra script that come with embedding an interactive map. Yes, we already have that recommendation in the post. 😄 Replacing Google Maps with a clickable image is definitely a great option. Great article! Thank you for going over how to use without installing a plugin. Sometimes less is more!